Rick Scott, who spent years destroying the health care industry, and then spent years destroying the state of Florida as its corrupt Governor, now wants to become the state’s corrupt Senator. Scott is one of the most uniquely worthless politicians of his era, because he’s so plainly for sale to the highest bidder, the most corrupt of billionaires have always been quick to fund his campaigns – which explains why he’s in a shamefully close race against respected Democratic Senator Bill Nelson. But I’m not here to talk about any of that. I’m here to talk about that damn hat. 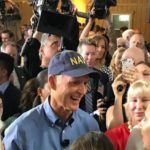 Rick Scott keeps making a point of wearing a “NAVY” baseball cap during his political photo-ops. When he shows his face in campaign ads on television, he wears the hat. When he occasionally pretends to care about Florida’s hurricane victims, he wears the hat. It’s time for him to take it off.